This tongue jack has been designed to conveniently bolt-on to the A-frame of your Marathon kit trailer, avoiding twisting while adding stability. It provides a fast and easy way to hitch or unhitch your trailer without any heavy lifting. The foot base will spread the load on the jack and prevent it from sinking on soft ground. By keeping the coupler and wiring elevated you reduce damages caused by dirt and abrasion; extending the life of your trailer. This corrosion-free tongue jack is an excellent addition to your Marathon trailer. 1.25 inch x12 ft. 2000lb. Ratchet Strap with Web Clamp and Safety Snap Hooks. The Web Clamp easily secures your extra webbing like a mouse trap. This eliminates the need to tie various knots or risk the extra webbing blowing in the wind. The Safety Snap Hooks gives you added security that the hook wont come off the anchor point. Great strap for powersports or hauling miedium duty equipment. Tongue Jack This tongue jack has been designed to conveniently bolt-on to the A-frame of your Marathon kit trailer, avoiding twisting while adding stability. It provides a fast and easy way to hitch or unhitch your trailer without any heavy lifting. The foot base will spread the load on the jack and prevent it from sinking on soft ground. By keeping the coupler and wiring elevated you reduce damages caused by dirt and abrasion; extending the life of your trailer. 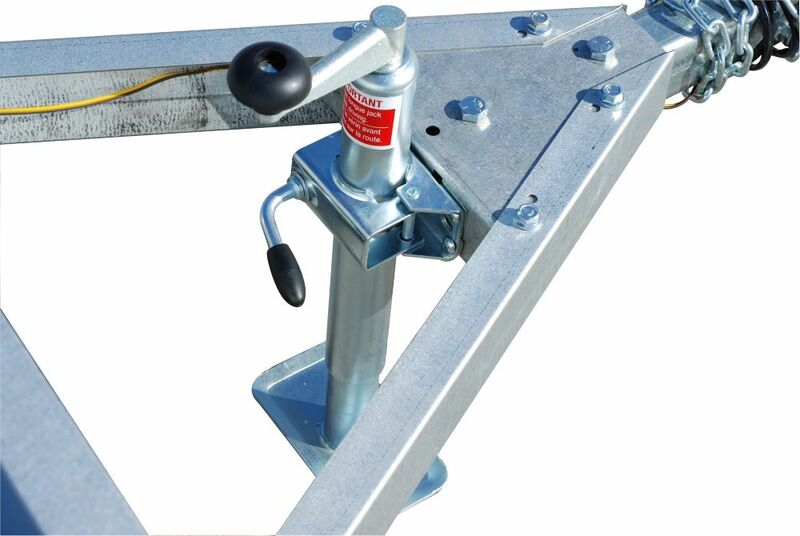 This corrosion-free tongue jack is an excellent addition to your Marathon trailer.